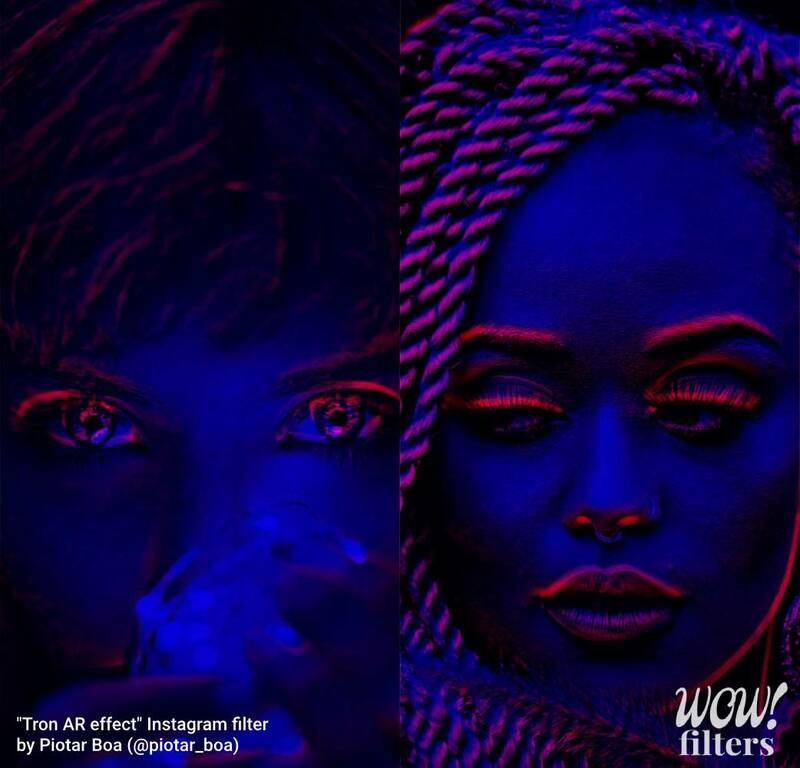 Published on Apr 12, 2019 | Filter name: "Tron AR effect"
I've seen many AR camera effects since I start using AR filters. Some of those camera effects were unique and interesting, others less exciting. 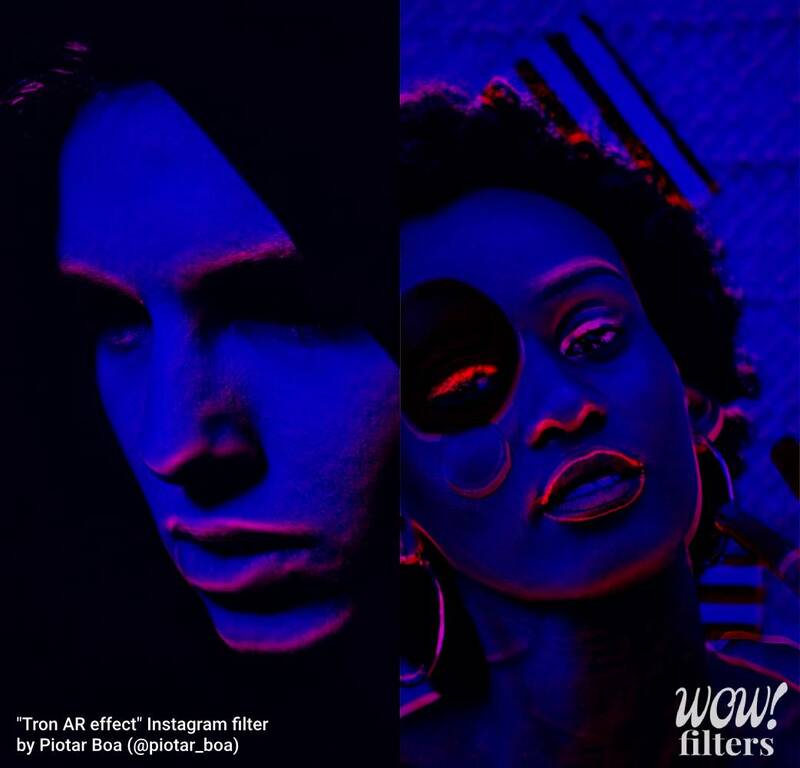 Today I came across an Instagram camera effect that I really liked and it's called "Tron AR effect" by Piotar Boa. Piotar described it as a Tron effect in AR. It indeed produces that unique futuristic neon highlight effect. It highlights and outlines the fine high-contrast intersection parts of the image. It makes the base image looks monochromatic with a blue tint and doesn't highlight solid areas. If that was the case, most of the image would be highlighted. This way, if you put your hand in front of the camera, you can see that only the contour of the hand is highlighted. If you put it in front of the screen of your computer, you can see that all the fine text, lines, and fine-detail UI elements are highlighted, but the solid color areas are not (see the image above). This effect is inspired by the movie TRON (1982), a sci-fi action movie about a computer hacker that was abducted into the digital world and forced to participate in gladiatorial games. The movie received a sequel, TRON: Legacy (2010), wherein that more modern film, the son of a virtual world designer goes looking for his father in the same digital world his father designed. Many creative artists have been inspired by the visual effects of these movies. Tron Legacy has become a modern cult classic and its unique neon art style continues to live on and inspire many artists to this date. Steven Lisberger, the director of Tron in 1982, got his inspiration when he saw video games for the first time. Piotar Boa (Fabio B. Forgione)) was also inspired by it and that lead him to create that unique filter. If you read my reviews, you know that I liked to experiment a lot with every filter I try and try to create unique results by combining filters with images, videos and real-world footage to see what works best for that filter and see if I can come up with some cool results. I see many filters as a tool that allow me to create things of my own, not different than filters in photo editing applications like Photoshop. The fact that we can apply them accurately on our faces helps us deliver those tool more engaging and fun to use. They allow us to become part of the artwork itself, rather than sharing things ins our surroundings. Suddenly we are the focus of attention in the beautiful artworks that we share. We enjoy experimenting with it and creating things that make us look the way we want to be perceived by others and ourselves. 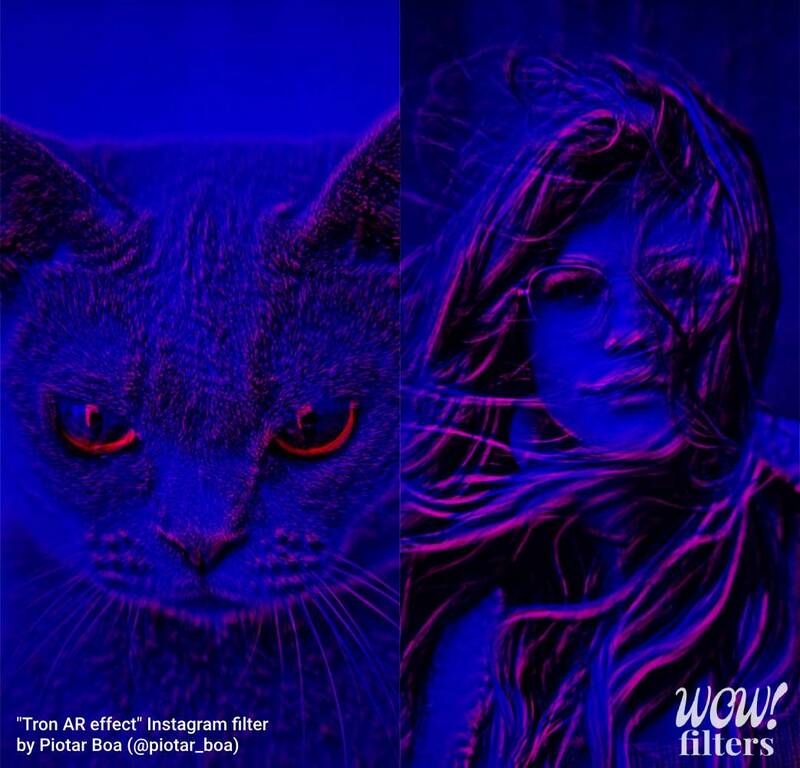 Tron AR filter is a camera effect, but because of the way it is designed, it produces that beautiful effect that works great for anything, not just self-portraits (selfie) images. The blue monochromatic filter help produce that high-contrast, sci-fi Tron-style color theme. It can produce some really awe-inspiring creative results for selfies, but almost every place that I point my camera at, it produces some cool results. Having said that, it depends on the lighting in the scene. For example, when my room was well-lit, it produces nice prominent glowing lines, but when I dimmed the light, it produced a flat selfie with very little highlighted effect. Also if the scene has plenty of solid color areas, it's not detailed, the image appears flat and not interesting. So my suggestion to you is to try to play with the lighting if possible, or position yourself, if you are outdoors, against the sun in a way that it can produce more interesting results. The fact that this Instagram camera effect works with lighting, allows us to have more creative freedom and we can direct the result and come up with something special of our own. It's definitely not the first time that I use a camera effect that works around color intensity but as I said, it depends on the result. The result of this one I really liked. Things that look boring might actually turn out to look amazing with this filter. This is why I enjoy experimenting with this AR filter again and again. You start to discover "new worlds" with it. It's also inspiring for creative people who enjoy stimulating their senses and discover new things through the camera lens. Because everything works in real time, it's easier for us to do just that. There is no need to import images, apply multiple filters—these creative tools are in our fingertips and accessible in just a few taps. The pink highlighted color cycles on and off from full opacity to a low opacity. 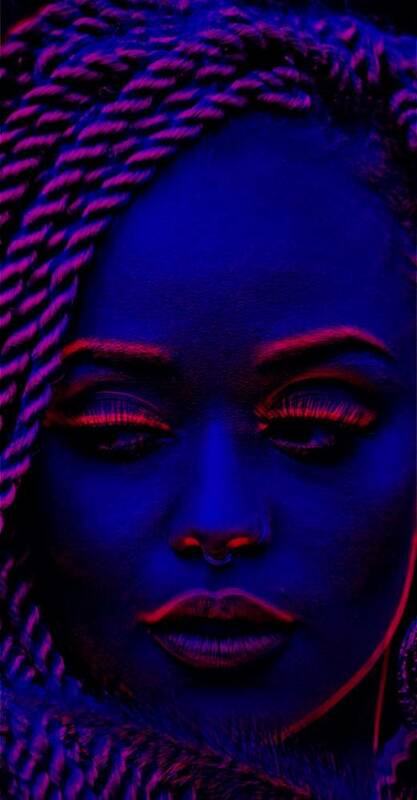 This makes the effect more appealing for video but when I took photos, of course, I was waiting for a higher opacity so that unique Tron effect can shine through. I have no doubts that many people will enjoy using it. I had a great time with it, and it's one of those filters that you want to keep so you can pop it out at certain times and take some really gorgeous pictures and videos. I highly recommend trying this filter out and of course, following its creator—Have fun! Try this Filter! Don't forget to follow the filter creators to gain access to all of their filters.